Most people recognize Dolores Huerta for her work in the farm labor movement and in the struggles for women’s rights and civil rights. 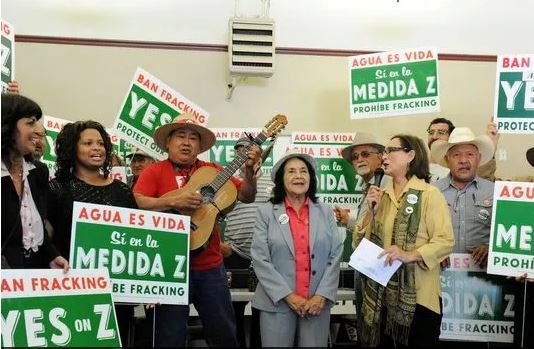 On Tuesday in Salinas, Huerta showed her environmental protection side at a rally and march in support of Measure Z, the countywide proposal to ban fracking. Sporting a gray pin-striped suit and crimson blouse, the diminutive but fiery leader, now in her 80s, stood before the cameras and addressed the crowd. “There are a lot of issues … but if we don’t take care of Mother Earth all is lost,” said Huerta.